Pick one... 3-3.5" 4-4.25" Full Size 5"
I have a quick click for my micro 9, it works so well I wanted one for my Kimber Ultra Carry 2. These holsters are the best. I will recommend them to all my students in my classes plus I do a show and tell. My firearm fits great. Very comfortable and very easy to clip on to your waistband. Now my wife wants one. Great company to deal with and shipping was fast. This is a great product. I purchased this for my Kimber Ultra Carry 2 and it fits perfectly. I was using a carry holster from Kimber designed exclusively for this firearm and I must say that I am way more pleased with the JM4 product. It is of very good quality and holds my pistol perfectly. I find that it is very versatile and comfortable to wear regardless of how I am dressed. I have had problems "profiling" while carrying with other products but this holster really keeps it close, even when wearing just a t-shirt it is hard to notice. I highly recommend this product and will be using JM4 Tactical for future carry needs. Use it all the time old holster was a little more difficult to use. This one i can remove and install in my vehicle with ease to hold pistol with in reach very satisfied with my purchase. This is my go to holster. Hello. I bought the original Quick click holster in brown for a Kimber ultra carry. The shipping was fast from Texas to Vermont in 3 day’s that was nice. The holster is of fine quality. The Herman Oak leather is the best in leather. Very stiff has to be broke in. At first it’s so stiff it pushed my slide back a little. That’s what JM4 video said on their site. So worked the leather and let the gun hang out in the holster for a day or two. Now it has form fitted to my gun. Very pleased. Love the magnet retention and very easy to take on and off. Or to put in a different position. The magnets are strong you don’t have worry about it coming undone. I only wore a few times it’s Comfortable. This is my fourth holster. It maybe my last for the holster hunt. My buddy is into his7th hunt. He looked at my JM4 . Now he is going to give it a try. I just purchased a new 1911 and needed a quality holster. I checked a couple of companies I currently have holsters from for other pistols. I found JM4 and liked what I saw so I figured I’d give it a shot. 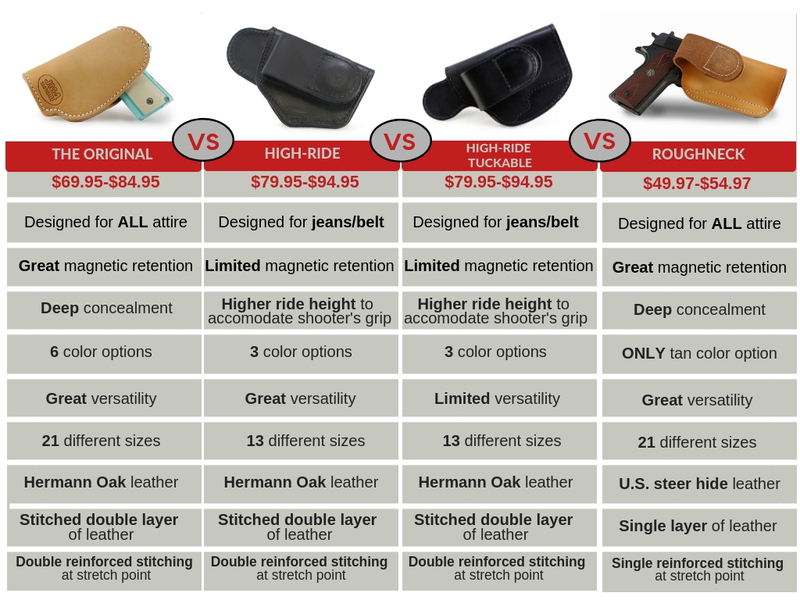 As we all know, holsters stack up pretty quick when you don’t find one you like. My JM4 quick click is perfect. Great fit for both the firearm and myself and I can wear it in a couple of configurations comfortably. I usually wear IWB and don’t like a lot of the over engineered kydex contraptions. Well done JM4, your products will be my go to first try from now on. Loved it as soon as I got it! Even with my Sig Scorpion 1911 45 cal. And yoga pants, it stays where I want it to stay!